This is one the famous Basil Leaves in Thai Kitchen. 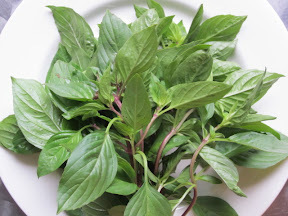 Sweet Basil will appear in many different dishes such as Stir Fries or Curries. Despite complimenting many important dishes, sweet basil remains team maker, but we can never do without, replacement is absolutely impossible. For example Green Curry, you may use different eggplants. If you don’t have Thai eggplant, you can use the long green eggplant instead, but if you lack sweet basil, your green curry will miss the essential aroma that makes green curry so desirable. It’s the after taste that grows in your nose. Sweet Basil could also be eaten raw with the Spring Roll or the fresh Spring Rolls. If you are living in warm Locations, you can grow sweet basil. After taking the young shoot and young leave of sweet basil, maybe you can try to place the stem of sweet basil(with a few leaves left) in a vase with water cover the hard stick for a few days. The good unbroken stalk will develop small white roots after a week you can try to pot them. Maybe you can have your own sweet basil right from your own flower pot.